Now in its tenth year, the Santé Restaurant Awards program was created to recognize excellence in restaurant food, wine, and spirits service and hospitality. The program includes four distinct categories: Culinary Hospitality, Wine Hospitality, Spirits Hospitality, and Service Professional. Santé Restaurant Awards for each category are given to winners in eight regions nationwide (New England, New York City, Mid-Atlantic, Southeast, Midwest, Mountain/Southwest, California, and West Coast). 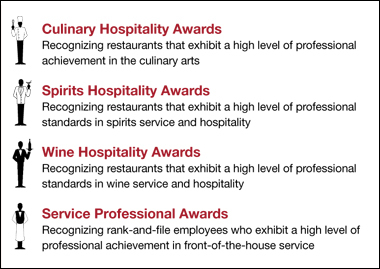 Six Grand Awards also are presented each year: Culinary Hospitality Restaurant of the Year, Culinary Professional of the Year, Wine Hospitality Restaurant of the Year, Wine Professional of the Year, Spirits Hospitality Restaurant of the Year, and Spirits Professional of the Year. Santé Restaurant Awards applications are judged by a panel of three top professionals in each category. The 12 Santé Restaurant Awards judges choose winners based on a variety of criteria, including management philosophy, staff training, service, list selection, recipe and menu development, creativity and innovation, promotional activities, special events, and ambience. 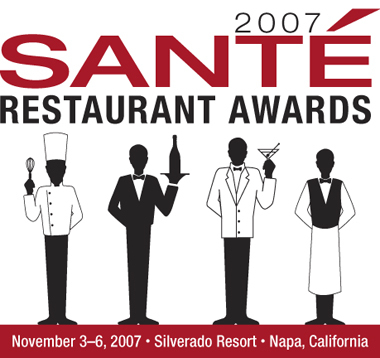 Since its inception, the Santé Restaurant Awards program has chosen over 400 winners from over 1,500 applicants. Winners include owners, chefs, food and beverage managers, general managers, and wine and bar professionals. They represent all sizes of operations, from some of the largest restaurant corporations to small independents and everything in between. What they have in common is a passion for their work and a commitment to excellence.